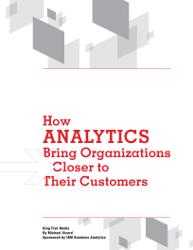 Download this primer to learn about the power of analytics to fundamentally change the way business is conducted. Commencing with an overview of trends, this paper helps you discover why CMOs need to be at the nexus of an information hub around which the rest of the company revolves. It highlights how to use data to move relationships from transactional to those which provide meaningful value to the customer’s business process.